The KalaXY 1650 Automatic XY trimmer is designed to cut rolls of media into sheets. This 65” trimmer is suitable for cutting various materials, e.g. paper, laminated paper, vinyl, pvc banner, wall paper, etc. Automatic X/Y (cross X longitudinal Y) trimming with rotating blades from roll to sheets. Ideal to save time and gain efficiency in repetitive cutting jobs involving hours of manpower. Perfect for cutting many types of rolled media, such as paper, photo paper, vinyl, laminated substrates, encapsulated paper up to 10 mil thermal films on both sides (500 microns - 20 mil total), light PVC banner, polyester films, polycarbonate and other. Cross blades are positioned manually to match image size. Longitudinal trimming is programmed from the control and can be ran in 3 different modes. KalaXY comes with the same 3" self-locking shafts, used on Kala laminators in 65". 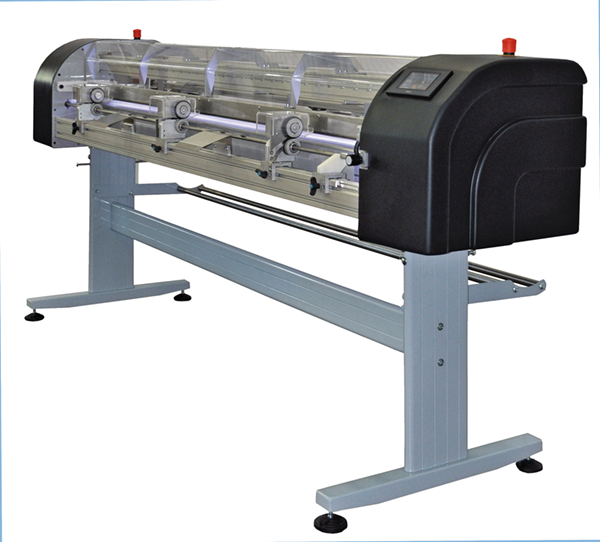 The roll of laminated prints can be collected directly from the laminator and installed on the trimmer. As standard, KalaXY comes with 3 longitudinal blades (2 side blades, and one double blade). Additional single or double blades are available as an option.